It always felt like it was going to come down to this – Leafs versus Bruins in a Game 7 winner-takes-all. And yet it felt all but over mere days ago. In the pre-game on Sportsnet, Elliotte Friedman pointed out Lou Lamoriello going down to talk to Frederik Andersen before Game 5 and his reaction after the win, banging the desk a few times with his hand — a rare show of emotion from Lamoriello. Losing to Boston in a hard-fought series is understandable – they are a top five team in the league – but before Game 5, they were not putting up much of a fight. Had they lost easily in Game 5, rightly or wrongly, there’s no question it would have led to a lot more scrutiny and tough questions than what they’d face at this point moving forward. Two losses in Boston to start the series, a win to make it a series in the first game in Toronto, and a Bruins win without Patrice Bergeron saw the Bruins take a commanding 3-1 lead. Going into Game 5, things did not look promising, other than the return of Nazem Kadri. The team started well, almost blew another 4-1 lead in Boston, and lived to fight another day. They then returned to Toronto again, and Frederik Anderson stole the show with an incredible performance leading the Leafs to victory. It’s not exactly the way we thought we’d get here, but most had this series going seven games (myself included – and I picked the Leafs to win). That’s part of what made the 3-1 series lead so surprising; the other part was how easily it seemed the Bruins were doing it and how few answers the Leafs were coming up with. If it wasn’t clear after Game 5, it’s very clear Kadri’s absence was a series-changing factor. Not only did the Leafs lose their matchup center — throwing their entire roster off balance — it moved the Bozak line into steady third line minutes against a strong Boston team when really they are a glorified, sheltered, offensive fourth line. Even with Kadri not back in his shutdown role, the depth he has added to the team has made a huge difference, and his line has scored in both games since returning. A series also has a funny way of evening out. The Leafs came out of the gate strong in Game 2, and yet seemingly everything the Bruins put on net went in, in addition to Rask playing well. In Game 6, it kind of had the same feel, as the Leafs were out attempted 62-33 and came away with the win. As the Bruins were peppering them, the Leafs were able to go down the ice and score quickly twice. 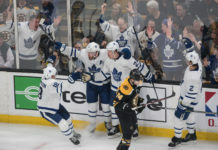 Even Game 4 and 5 were pretty similar, as the Bruins capitalized on the Leafs mistakes for quick goals and hung on to win, while the Leafs managed to build a quick lead in Boston by burning the Bruins anytime they opened up some space. That brings us to Game 7, where anything can happen. Leafs fans will obviously know that as well as anyone. There was a bit of a feeling that Game 5 exorcized some demons against the Bruins by holding onto the 4-1 lead, but let’s be honest — the real exorcism would take place in Game 7 on Wednesday. It didn’t seem like the Leafs would get this opportunity a few days ago, but they’ve clawed their way back and earned this. – Early in the game, William Nylander skated up ice with the puck, the Leafs got it in deep, Nylander was first on the forecheck, and he won a battle to get the puck to Nazem Kadri, who centered the puck. The Bruins shot the it over the glass and the Leafs got an early power play out of it. That kind of set the tone for Nylander’s best game of the series; besides his goal – where he won another battle to create the play in the first place – he was just aggressive all over the ice, creating turnovers and using his body (which we rarely see). He played 14 minutes, scored his goal, put two shots on net, and threw two hits. – Game 6 was the first time I noticed the Leafs actively leaving James van Riemsdyk out to play on both PP units. He played 4:08 with the man advantage, and the next highest forward was Marner at 2:59. There was also an instance very late in the third when he was on the ice for less than 15 seconds – I think it was a mistake that he hopped out there. They don’t trust him defensively at all, but he can still score, with three goals and an assist so far this series. All that matters right now is Game 7, but these are things to remember in the summer when he wants a long-term deal and everyone obsesses about the fact that he had 36 goals this season. – Only five penalties total in the game meant a lot of even strength time and the Leafs really rolled their lines – their lowest forward played 12:03 (Kasperi Kapanen), and their highest played 17:53 (Zach Hyman). The Bruins had three forwards play fewer than 10 minutes and both Bergeron and Marchand played over 22. One team has a top line they rely on and the other is more focused on depth. We’ll see how that plays out in Game 7 now. The Bruins were basically double shifting the Bergeron line for long stretches of the game. – Keep an eye on defensive zone faceoffs for the Leafs. They have a set play where they go around the net if they win it and try to hit the winger, who releases to the blue line where the boards are. The Bruins were reading it and cutting it off at the top of the circle. Late in the game, the Leafs won a defensive zone draw to Hainsey and he turned as if he was going around the net. He then stopped and went right up the immediate boards and out. – When the Leafs were on the power play, the Bruins basically dared the Leafs point men in Jake Gardiner and Morgan Rielly to shoot from the point, and they responded by passing to the half-wall. When they did, the Bruins would pressure immediately. The Leafs power play came into the game converting on three of their last four attempts but went 0/3 on the night as the Bruins slightly altered their strategy by really clogging the middle and pressuring the half-wall. – Jake Gardiner, by the way, led all skaters in the game playing 25:22. He was the Leafs most consistent defenseman at breaking out clean. His habit of holding onto the puck can sometimes get him into trouble, but he was able to spin off forecheckers and make plays – he had a 48.84CF% and only three players on the Leafs finished better than that. One was his partner Nikita Zaitsev, who had a nice shot for rebound on Nylander’s goal. – I’ve always said in this space that I’m not a goalie guy and have little to offer other than, “he played well; he played poorly; he was in too deep; he was too aggressive; his rebound control was bad.” For that reason, I rarely note anything about goalies here because I don’t feel I have much to offer — which I still think is true. That said, I had to carve out some space to discuss how great Frederik Andersen played. A few games ago, I noted he looked tired and he has been struggling since March, both of which are true. But the last two games he has been incredible. Given the circumstances, those were arguably his two best games as a Leaf. Backes elbowed him really hard in the head in the third, and he shook it off and kept going. Later, he made a big save in the slot on Sean Kuraly, who was left all alone. The Bruins tried throwing shots on for rebounds and he battled through a lot of contact to cover pucks up. Just a fantastic game by Andersen. It seems like forever ago now that the Leafs had major goalie issues. – The play I’ll remember most from the game is Connor Brown’s back check after blocking a shot and setting up a 2v1. He had a long way to go to come back, and the Bruins had a clear 3v2 on the Leafs – pure hustle to get back and stick lift Patrice Bergeron. Pretty good player. I wanted to make sure that I had a note in here on this. We’re all sending our thoughts and prayers to those impacted. Let’s be sure to take care of each other. I thought the crowd was noticeably nervous for the first two periods but really came alive in the third. When the Bruins made a final push, they were fantastic and were on their feet for the whole thing. It was great to see. Last year, Mitch Marner battled mono before the playoffs and was not himself. This time around, he’s probably been their best player throughout the series. 1. I think it would be hard to justify changing the lines, at least to start the game in Game 7. If they didn’t when they had matchup control, there’s not much point now. 2. I think I would be ready to reunite Kadri – Matthews – Nylander at the end of the game, if need be, for offense. That would mean the Plekanec line can stay intact and when a breather is needed. You can cobble together Bozak centering whoever else is playing well, which would most likely be Hyman and Brown. The benches shorten up at the end of games like this. 3. I think I would let Morgan Rielly and Jake Gardiner shoot away on the power play if the Bruins are going to back right off. Both can shoot – Gardiner has a hard slapshot and Rielly wrists in good shots through traffic. JVR is as good of a net presence as there is, so if the Bruins are going to encourage them, let it rip. 4. I think the focus has to be clean breakouts as much as possible. It’s okay to have winger get the puck at the top of the circle in their zone instead of releasing to center. They can look for the little bump to the middle from there, which has worked at times. It’s there. Obviously, that’s how they scored the empty netter. A little earlier in the game, Matthews bumped one through his legs to Travis Dermott for a clean out. 5. I think there will be a lot of nerves to start Game 7. Get a few pucks in deep, finish some checks; gain the zone, put a puck on net for a rebound, and drive the crease hard. Get your jersey dirty early and get right into it to shake off those nerves. 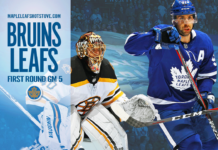 It’s a different group of players on both sides, but the Leafs owe the Bruins one.